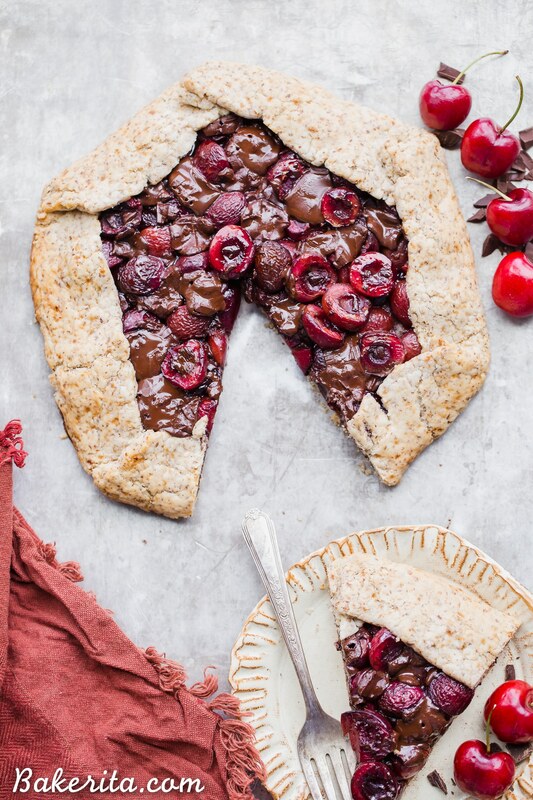 This Chocolate Cherry Galette is made with dark chocolate and fresh red cherries, all tucked into a super flaky pie crust that you would never guess is gluten-free, paleo and vegan. 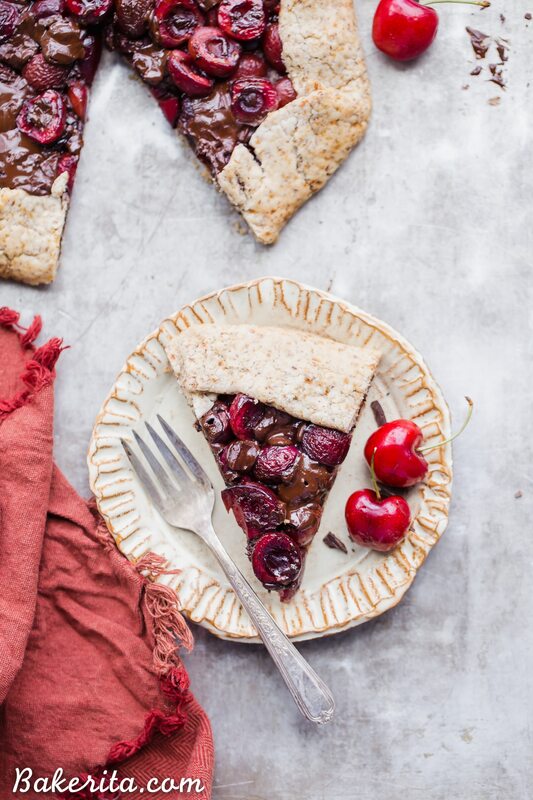 If you’re a cherry fan, you need to try this chocolatey treat out ASAP! I’ve been turning to Instagram polls on my stories a lot lately to get your input on the recipes that I’ve been churning out of my kitchen, and unsurprisingly, you guys gave some DELICIOUS, wonderful guidance on this one. I was making a cherry galette and polled whether you guys wanted the cherries paired with berries or DARK CHOCOLATE. I was leaning towards berries, but when dark chocolate won by a landslide (like 80/20) I had to go with chocolate (that’s why I LOVE asking for your input!). You guys were right. Dark chocolate + cherries are a match made in heaven and the combo was incredible (this chocolate cherry cheesecake is another winner with this combo). 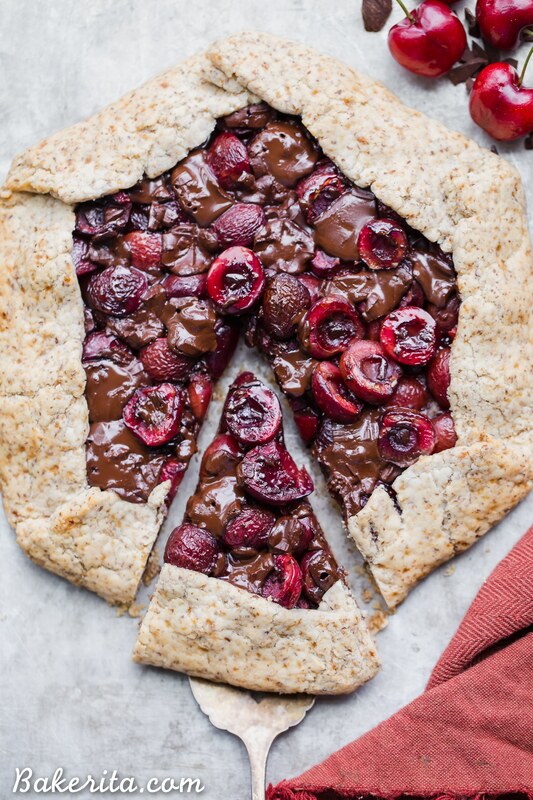 Half of this chocolate cherry galette got devoured the night I made it…and that was just with two people. I could eat the crust all on its own…it’s that good. It’s made with almond flour, tapioca flour, flax seeds, a little coconut sugar for sweetness, and coconut oil. Simple, vegan, paleo, and SO flaky you wouldn’t believe there isn’t any butter in it. Of course, it’s even better with chocolate and cherries piled on top of it :) I kept the filling super simple with just chocolate and cherries that were tossed in a little maple syrup, tapioca flour to help thicken, and vanilla. No need to overdo it here – the chocolate and cherries can shine all on their own. While I don’t love rolling out crusts, galettes are the best kind of crust to roll out – no need to transfer it to a pie pan or anything like that. They’re pies for the lazy chef ;) I like rolling it out on a sheet of parchment paper and then once it’s rolled out, sliding the whole thing onto a baking sheet. Then just pile on the toppings, fold up the sides, and bake! It all comes together into such a decadent galette. You can add vanilla ice cream on top if your heart is calling for it, or just leave it be. So delicious either way. I hope you’ll give this one a try – enjoy, my lovely friend! 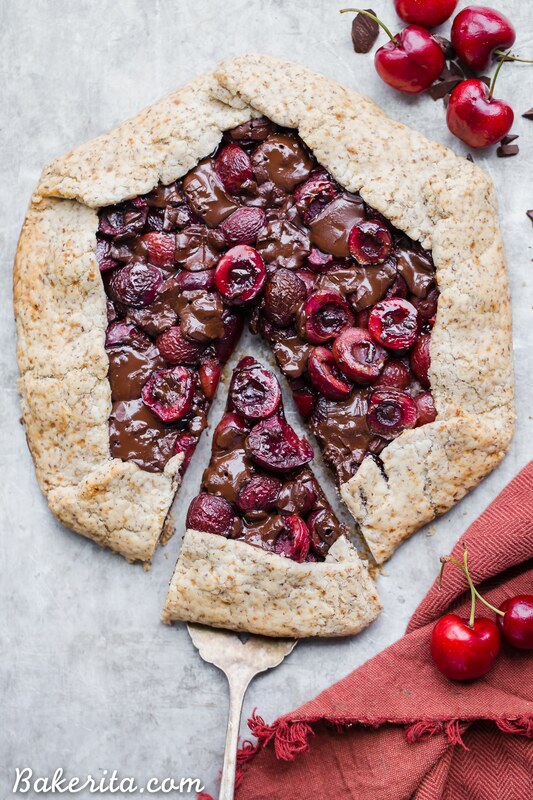 This Chocolate Cherry Galette is made with dark chocolate and fresh red cherries, all tucked into a super flaky pie crust that you would never guess is gluten-free, paleo and vegan. 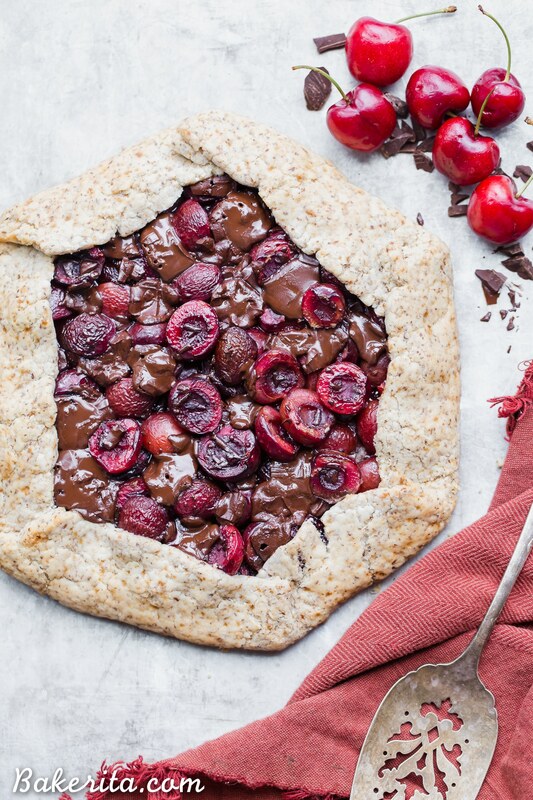 If you're a cherry fan, you need to try this chocolatey treat out ASAP! Preheat oven to 375°F. In a medium bowl, stir together the halved cherries, maple syrup, vanilla extract, and tapioca flour. Toss until coated. Add in the chocolate chunks, reserving some to put on top. Set aside for now. Combine the almond flour, tapioca flour, ground flax, coconut sugar, salt and coconut oil in a food processor, or use a pastry blender in a bowl. Pulse or blend until the texture of coarse meal. Add 2 tablespoons cold water and pulse/mix again until dough comes together. If you’re mixing in a bowl, you may want to use your hands to bring the dough together at the end. Roll the dough out between two pieces of parchment paper into a circle, about 10” across. You want it thick enough to be able to hold the filling and fold up the sides. Slide the parchment paper onto a baking sheet. Place the filling in the middle of the circle leaving about 2 inches around the edge empty. Gently fold the sides up, creasing the dough together with your fingers as you go. I used the parchment to help fold up the dough so it didn’t break. Brush the outside edges of the galette with some non-dairy milk (optional, gives it a little sheen). Let dry for two minutes, and brush one more time. Bake for 30 minutes until the edges are golden brown. Remove from the oven and let cool for 10 minutes before slicing and serving. Store leftovers tightly sealed in the refrigerator. Usually when I make a fruit dessert I don’t think about chocolate…but this combination looks DIVINE!! :) I am loving fresh cherries from the farmer’s market now too! The crust on this is incredible and cherries are sooo good right now- this one will be hard to beat. Thanks for the recipe!! I will definitely be making this again. So thrilled you’re loving it!! Thanks so much for your feedback, Alyssa. Could I use Chia seeds instead of flax? Haven’t tested it that way but that should be fine!